6 Critical Keys To Your Success On This Diet & Fitness Challenge! 1) Set a goal – I recommend you start with a goal of losing 1-2 pounds per week. Be sure to weigh yourself weekly to track your progress. Be sure to use MyFitnessPal daily! 2) Plan & pack your meals & snacks the night before. 3) Exercise on a consistent basis at least 3-5 times weekly. 4) Get an accountability partner & hold each other accountable in eating clean and exercising. 5) Pray, Pray, Pray! You will definitely need the help of God during this process. So don’t hesitate to pray for His help during the challenge. God’s grace is sufficient for you and He will give you the grace you need to make it through this challenge. I know I’ve only been successful because of the grace of God. 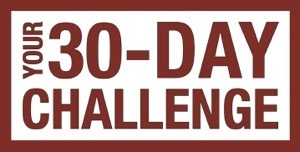 Previous Post Your 30 Day Diet & Fitness Challenge Is Here! Let’s Get it! Next Post You Are Strong Enough! Let’s Get It!